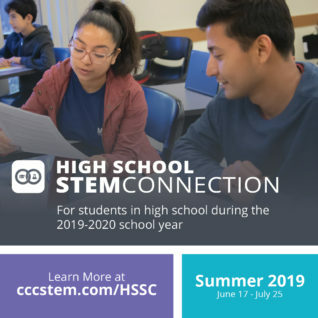 High School STEM Connection is a program for West Contra Costa School District High School students who want the opportunity to start their college journey now. Students have the opportunity to take a FREE math or science class during the summer semester at Contra Costa College. Students who successfully complete a math or science class through High School Stem Connection will earn both college transferable units and high school credits. The best part is the program is entirely free to the student and their families. The program itself will take place from June 17 – July 25, 2019.